It’s an honour to have been selected as one of the finalists in the Meroogal Womens Art Prize 2018. With a record number of 194 entries this year, 37 were selected as finalists. The judges for this year’s prize are Dr Caroline Butler-Bowdon, Director, Strategy & Engagement, Sydney Living Museums; Bronwyn Coulston, Unit Manager – Arts & Culture, Shoalhaven City Council; Deborah Ely AM, CEO, Bundanon Trust; and Lisa Havilah, Director, Carriageworks. Located in Nowra on the South Coast of NSW, Meroogal is a rare and precious Australien heritage house. Handed down through four generations of women from one local family, it tells many stories about the south coast community and the ‘Roogal’ women who lived there. It’s an honour to have been selected as one of the finalist in the Meroogal Womens Art Prize 2018. With a record number of 194 entries this year, 37 were selected as finalists. The judges for this year’s prize are Dr Caroline Butler-Bowdon, Director, Strategy & Engagement, Sydney Living Museums; Bronwyn Coulston, Unit Manager – Arts & Culture, Shoalhaven City Council; Deborah Ely AM, CEO, Bundanon Trust; and Lisa Havilah, Director, Carriageworks. The Meroogal house has barely been changed since it was built in the 1880’s. The distinctive ‘Carpenter Gothic’ house has been maintained by four generations of Thorburn and Macgregor women through the challenges and joys of daily life. When visiting you will discover the belongings they were surrounded by such as their favourite books, clothes, furniture photographs, ornaments, as well as their notebooks. Meroogal is an invitation into these womens lives, told through their home of four generations and their journals which reveals a glimpse into their everyday lives. I visited Meroogal for the first time a couple of years ago. It’s difficult not to be touched by this beautiful heritage home. I especially connected to the diaries and felt a deeper connection to the place through the words written so long ago on the browned paper of the old notebooks. Reading through the journals written by ‘Tottie’, it was evident that life was often fragile and tough for the Meroogal Women. However, Tottie also shared the things that brought them together for fun and joy. In 1893 Tottie was given a piano by a family friend. Visiting Meroogal it was easy to imagine the family gathering around the piano for music and singing. Tennis was another activity that helped take their minds off the fragility of life. I wanted to create an artwork that celebrated the things that brought the Merrogal women and family together. Captured in a playful assemblage my artwork ‘Playtime’ is celebrating the brighter side of the Meroogal womens life. 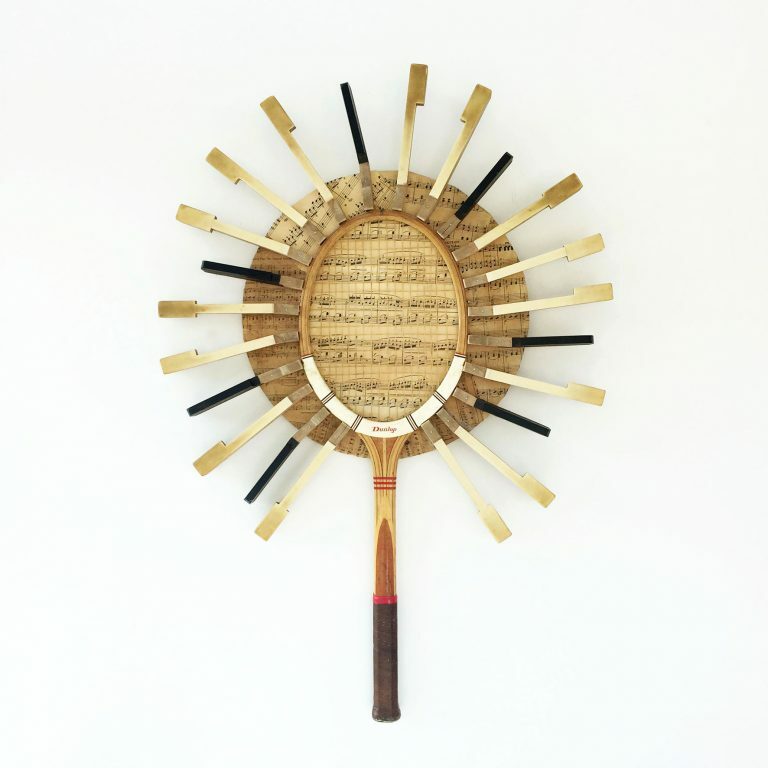 Created with an old tennis racket, beautiful old notepaper and recycled piano keys I aimed to signal joy, playfulness and connection. I’ve kept the piano keys raw and unpolished to honour the marks of human touch over time. Congratulation to all finalists, I am very excited to part of this exhibition and I am looking forward to seeing all the artworks exhibited throughout the Meroogal house. Information for this article was found on the Sydney Living Museum’s website here. You can read more about Meroogal here. Open Thursday to Saturday in the school holidays 10am–4pm. ​Entry by guided tour only, admission charges apply. Closed Good Friday, Christmas Day and Boxing Day. For more info click here.